It’s a name that conjures so many images. A sunset marred by clouds, a muscle car that won’t start, Marilyn Monroe refusing to leave her dressing room. 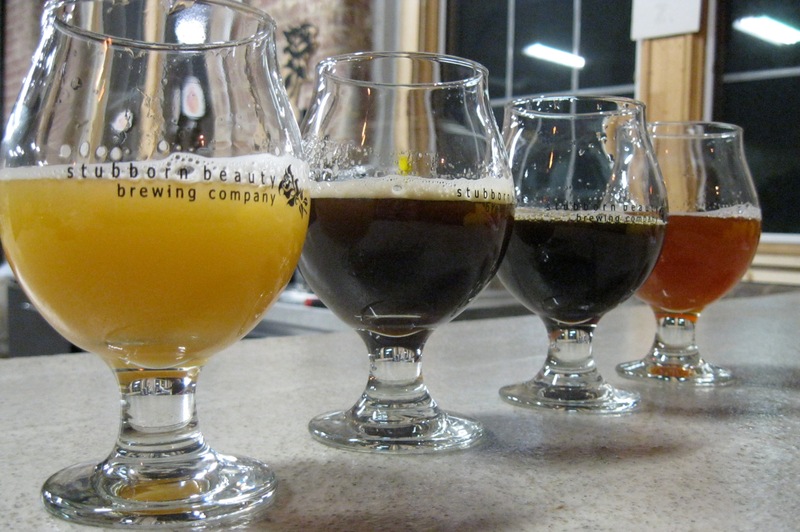 The name of Connecticut’s newest brewery — Stubborn Beauty — is whatever you want it to be, its owners say. Open to interpretation, like one of their ales that spins the needle around the style wheel. Unlike their blasé view of their brewery’s name, everything that Shane Lentini and Andrew Daigle have done to get Stubborn Beauty off the ground has been calculated and deliberate. That’s not to say they’re overly confident. “Realistic to a fault,” is how Lentini put it. A couple weeks before the brewery’s grand opening (this Saturday, March 1 from noon to 5 p.m.), I chatted with the two men as we stood over their bar in their welcoming maroon tasting room. The brewery is housed in 2,500 square feet of a remodeled former bicycle factory. While we talked, Shane poured samples from a tap system complete with Stubborn Beauty handles, into Stubborn Beauty snifters. A Frank Zappa live album echoed in the cavernous, exposed-brick space. The men started homebrewing with their turkey fryer only five years ago. Experiments led to competition, including an entry in Sam Adams’ Longshot American Homebrew Contest, where they received praise, but no winning entry. The dream of creating a brewery started early, and over the years they planned their ascent. New Britain natives who’ve known each other for more than 20 years, Lentini and Daigle – both 37 — were determined to brew their beer with flair but run their business conservatively. After forming Stubborn Beauty as a limited liability company back in 2009 and bankrolling the operation for years, the men signed a lease last April for the space, in a building owned by the City of Middletown. They received state permits last November and town permits about a month ago. They said they’ll likely keep their day jobs for two or three years – Daigle is a medical equipment technician and Lentini works as an IT engineer – and are happy keeping it a two-man operation. “I’d rather fail than only own 51 percent,” Shane said, explaining why they used their own money and shunned investors. Their creative outlet will be on a 3.5-barrel system with 7-barrel tanks (each barrel is about 31.5 U.S. gallons), which means they’ll be double-batch brewing. They’re waiting for a system last used at a Tennessee brewery, but it’s been delayed. After amassing a repertoire of 60 original recipes, the brewers have decided on four flagships: their How Rye I Am saison, Kommandant Lassard dunkelweizen, Porter Justice porter, and Nummy Nummy double IPA. My favorite was the saison: funky aroma, smooth mouthfeel, with a gentle bitterness. They want to methodically gain their own following, beginning with 125 members of a growler club; for $125, you get a steel growler and half-off fills for a year. Trying to imitate another brewery is fruitless anyway, Lentini said, because you can’t perfectly recreate a water profile. Stubborn Beauty uses the city water supply before it reaches the treatment stage, so it’s like getting well water, they explained. It’s on the soft side, which makes it rather flexible for different styles. That’s not to say they wouldn’t tweak with the water composition for a future beer. Saturday, March 1, noon to 5 p.m.
Stubborn Beauty Brewing: 180 Johnson St., Middletown, Conn.
Tuesday, March 4, 6 p.m.
695 Main St., Middletown, Conn. 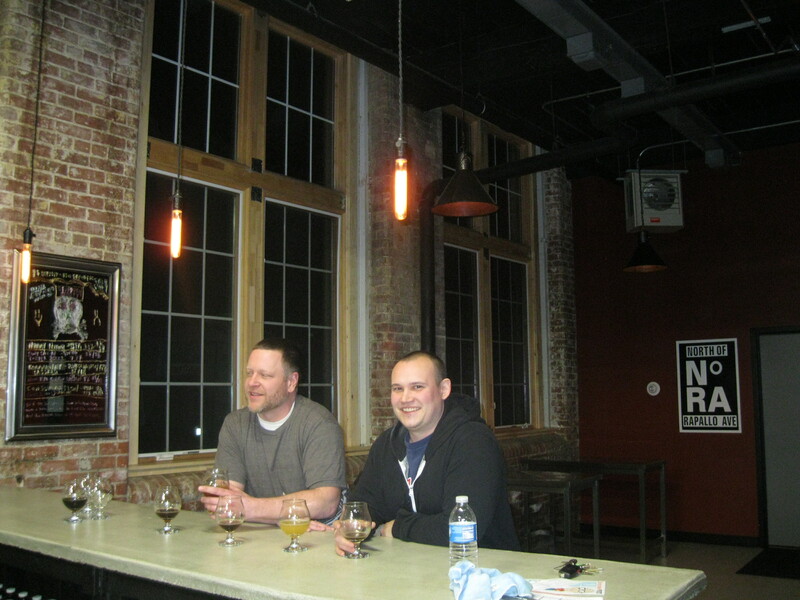 This entry was posted in Beer Snob and tagged Stubborn Beauty Brewing. Bookmark the permalink. They were at the Ski Sundown Brewfest in September and I can attest that the Kommandant Lassard dunkelweizen is pretty awesome. Glad to see they’re in their own space now! Wish them lots of luck! I liked that one a lot. Stop by their place one of these Saturdays if you can. It’s the kind of place I’d hang out in for a while; nice industrial atmosphere.